There is hardly a way to end a discussion about Beauty. We think we see it but we feel it, rather. Talking about what we feel makes us grow and get closer to others in a genuine way. I asked friends and people I love to give their personal opinion on this elusive question, and then to illustrate their answer the way they want. To me, balance is beautiful: the perfect combination of strength and restraint. The exact moment when opposing forces share a powerful moment of stillness. The idea of balance is the basis of my work as a skin care therapist, all systems must work together to allow the skin to be beautiful. 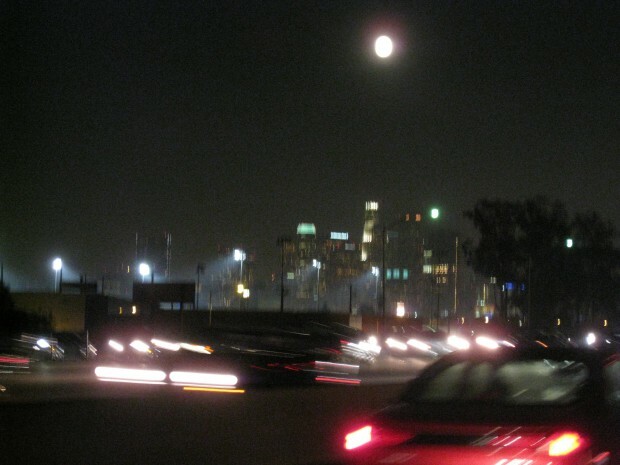 I took this photo while sitting in traffic on the freeway in Los Angeles, California; the full moon insists on being part of the landscape, shining thru the layers of man-made pollution and illuminating the sprawling city below.